This giraffe painting is titled Slurp. prints are available starting in the 8x10 size. Great for a playroom or nursery. This is a work in process / art studio picture is this green tree frog painting as it was still being created. I created these adventure huts on both canvas and watercolor paper. 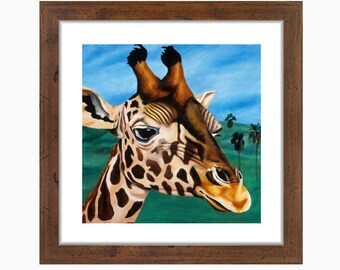 This giraffe painting is called King because I felt he was just so very regal in his approach. Prints start at the 8x10 size here in my Etsy shop. This is an original painting. I designed the crown using historical crowns from the Merovingian dynasty as reference. There’s a lot of intensional symbolism to this painting. I love getting picture of my art in a nursery. These are original paintings on canvas of sail boats. Part of my fairytale and adventure series for childrens rooms. This giraffe painting is available as an art print. Starting with the easily frameavlw size of 8 x 10. This sailboat is an original painting on box canvas. So it does not need to be framed, if the nursery is more contemporary in feel. This is a work in process pic of this front painting - print available here! The nursery of a client who used my artwork of sailboats in their crib area. This painting is available as the original painting and also as an art print. This painting is part of my fairytale series for a little girls room.